As happens, a company discontinues a great product in pursuit of profit. A Bosca two-pocket bifold card case I acquired in new condition at a rummage sale twenty years ago? No longer made. At the time, it was unneeded by me. In a drawer it sat until my decades-old wallet was deconstructing. Out of the drawer, loaded with a thin stack of plastic and business cards, with cash folded between, this Bosca became the perfect minimalist wallet. Fine leather, super thin. Easily a $90 bifold card case. But when this “wallet” can no longer take daily abuse, I find it is no longer manufactured! Bosca now does all their assembly in Asia. Thank you, no. My American cash is more comfortable in an American wallet. Within the orbit of American Toolbox the right craftsperson enters. Michael Hicks Design, starting up his leather craft business in ernest, listens to my needs. Offers multiple combinations of the finest ¾ oz Horween Chromexcel horse leather. Sends a couple sample card cases for comment. In no time, the finished product. How timely! The USA-made Bosca, no longer available, gave a final rip along the seams mid-week. Without hesitation, my gear slipped into the Hicks. A perfect fit. This card case / wallet will work forever. Plus, it is completely recraftable. Like my Aldens. 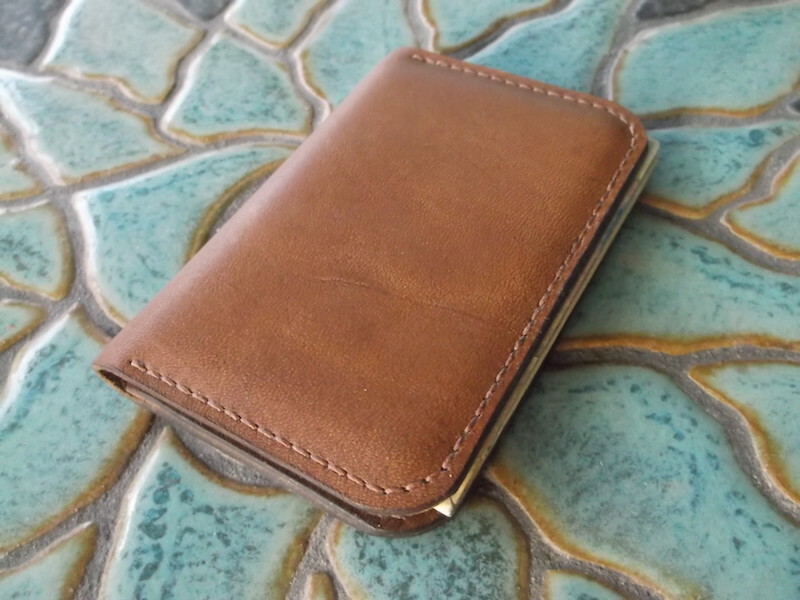 This entry was posted in Craftsman / Artist and tagged 3/4oz Horween Chromexcel horse leather, hicks original leatherwork, michael hicks design, usa made two pocket bifold card case, usa made wallet.